Bring an upscale edge to your living room setting with the Carmel Leather Chair and Storage Ottoman. Its plush leather chair and ottoman combine to offer a supreme lounging experience with its high backrest, cushioned seat, pillow padded armrests, and cushioned ottoman top. A push-back mechanism on the chair lets you recline to your desired position while the ottoman lets you put your feet up for added comfort. A lift-up storage compartment on the ottoman offers the perfect spot to keep your small knickknacks and the round base enhances the visual appeal of this traditional-style furniture. 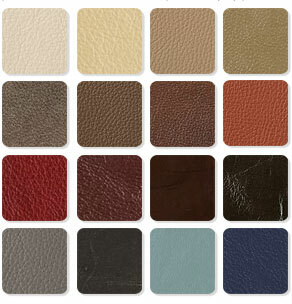 Custom-order leathers are available. Very comfortable and adjustable. Just what we were looking for. Easy to clean. Good value. I bought this for my son, he's loves it and is very pleased with the fit and the color. this is his go to chair when he gets home from work. Thinking of getting one for myself. why can't you be happy with a 5 star rating. "Review required?" We just love to hear from our customers as much as possible to improve their experience. We love them!! Very comfortable and wasn't difficult to put together with the help of another person we got both chairs and ottomans done in less than 1/2 hour. It's my favorite...used to use a fabric recliner My chair fits me .I love the leather and the color. It's gray but has green undertones. I love this recliner. It is very comfortable. I like having the separate footrest. What is the diameter of the chair's base? The Benchmaster Carmel Leather Chair has a diameter of 24".